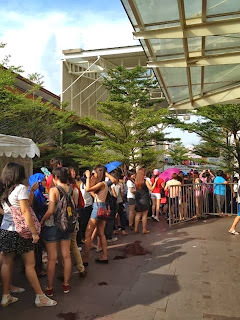 On 19 October 2013, Running Man came to Singapore for their first autograph session and Fan Meeting. This is reportedly the last stop for the Asia Fan Meeting and Singapore is very lucky to be the last stop. A friend of mine who is a BIG FAN of Gary helped us to buy the Category one tickets. Thanks to her, we managed to sit at the centre front row. We combined our Watson receipt in order to purchase a pair of priority tickets with autograph. The first 400 people who brought the tickets will be able to come down to Jurong Point for an autograph session at 11am, including those who had won the tickets. Dressed in my Running Man T-Shirt and my Kookie cap, I am ready for the autograph session! My friend picked me up at 8am and we headed down to Jurong Point in a group. It is really nice to have a group of friends who have the same goal as you. Surprising, this friend of mine even handmade an LED light designed with the face of Kang Gary. That was really amazing. She wrote a song and burned into a cd for Gary too. She drove us to Jurong point at 9am and we waited in the queue at the registration counter. Initially, there was some confusion in between as there was a large crowd near the vicinity and we had no idea where is the queue. We only heard a few security guards said to a group of youngsters telling them not to waste time if they don’t have the tickets and to get out of the queue. There are some who stubbornly waited only to get chased away. I felt that the organizer should prepare a banner or provide an obvious barricade to separate the autograph tickets holders and the crowds who just wanted to see the Running Man. Because of the lack of organization skills, we were left wondering how to get our colored tags. In the end we spotted the queue and received different colored wristband at the counter as we presented our tickets. Pens and papers were given to us to write our name for the autograph. We were quickly ushered out again after I wrote my name on the paper. My friends and I were guessing that the colored tags have something to do with the represented colours of the Running Man in the promotion poster. I was given an orange wristband, my friends received red and yellow wristband. We left that area as we were told to come back at 10.30 for the autograph session. Initially, we thought of changing the wristband among ourselves but in the end we decided to wait and see. We ate our breakfast at a corner before we go back to the queue again at 10.30am. By then, the crowds were towering us and we can neither go in nor come out of the area. There were screams everywhere and many people stopped by the vicinity for some curious stare. In the end, the host asked the people who had the wristband to raise their hand for the security guard to usher us into the queue again. That was really a bad idea since we are blocked by many people; however that seems to be the only choice for us. Finally, we managed to squeeze into the queue and we were quickly ushered in by the security guards. There were a few barricades and we are supposed to stand according to the colours of the wristband we are wearing: Red, White, Blue, Yellow and Orange. We waited in our queue as the Music was played at the background. The people were excited and were holding on to their cameras. As soon as the cast arrived, they stretched out their hands to take pictures. I could not see them clearly because of those hands which blocked my view. The Running Man cast put on their sunglasses, except for Ji Hyo who look stunning in person. They greeted the fans in English and tried to build a rapport with them. The host revealed that the Running Man will choose a colour each and the fans that have the same colour wristband will get the autograph from the particular Running Man. (HaHa-White, Gary-orange, Kim Jong Kook-Red, Song Ji Hyo-Yellow and Jee Seok Jin-Blue). The Running Man seated in their position as the host instructed us about the safety rules and not to bring out our handphone and camera when we go on stage. The reason is that they wanted the autograph session to end smoothly and quickly as the Running Man need to rush to Singapore Expo. We waited for our turn and I did not see anybody pushing and shoving. However, I cannot take good pictures because of the Security guard that stood right in front of the table. Finally, I was ushered to the stage and I forgotten that I am still holding my handphone, a security guard spotted it and asked me to keep it. I obediently kept it in my bag and forgotten all about it. I saw Song Ji Hyo and Kim Jong Kook sitting beside her and I was star struck the whole while admiring Ji Hyo beauty and Kim Jong Kook sharp features. I gave the paper written with my name to Song Ji Hyo and she gave me a ‘blank’ (Mong) look and she keep looking at Kim Jong Kook. She said hello to me in a gentle and soft tone, and signed her autograph on the Running Man poster. We had a handshake and I requested for a hug which she complied immediately. She is so slim but her grasp was pretty strong as we hugged each other. I said in Korean Sandangheyo (I love you) and Ji Hyo unnie smiled sweetly and thanked me. Before I exit the stage, I have a quick glance at Kim Jong Kook who was looking at the front. It looks like the cameraman was taking pictures of him. I was the first to receive my autograph and before I left, my wristband was snapped off by the staffs. Those who had received the autograph have to go out of the area and I was waiting for my friends to meet me at the mall. I was amazed that some strangers ask me to lend the autograph poster to them so that they could take pictures. Soon, my friends joined me and I was told that some people exchange the wristband among themselves at the queue. Although I am disappointed for not getting Spartakook autograph, I managed to see him twice and I should be contended. My friends hugged Kim Jong Kook and commented that his body is very tough and buffy. I know I should not be greedy since I met Kim Jong Kook in his fan meet in February this year. I hope next time, I will get his autograph. My friend who loves Gary got a hi-five with him and the autograph poster. Eventually, we are happy that we get to meet the Running Man cast up close and we are ready for the Fan Meeting at Singapore Expo. Thanks to my friend who managed to snap some photo at the autograph session. Stay Tuned for more of my Running Man Fan Meet Updates! !